Deconovo Polyester Cotton Blend Apron. Our 65% Polyester, 35% recycled cotton aprons are perfect for the home chef. Our aprons are coated with a special plastic to resist water and grease from penetrating into your clothes. Each apron is equipped with a neck tie and waist strap for easy use and comes with two pockets in the front for your convenience. 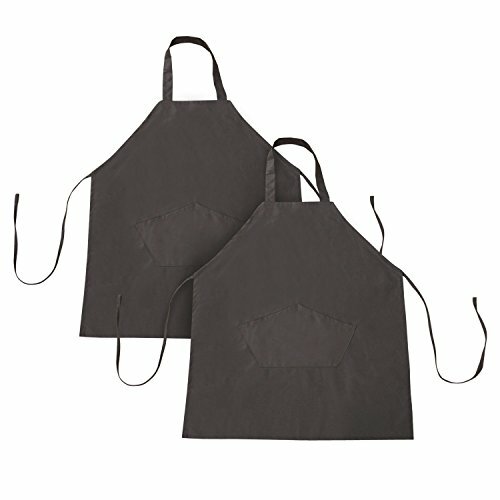 These aprons are used ideal for cooking, baking and BBQ. 1. Deconovo chef apron are 65% polyester and 35% recycled cotton blend. Size: 26 Width by 32 Length Inch. 2. These aprons have fixed neck tie and adjustable waist straps making it easy to tie and comfortable to wear. One size fits most. 3. Deconovo aprons are ideal to protect your clothing from unwanted stains and spills. We coat each apron to be water and grease resistant. 4. All Deconovo aprons are a great gift for Christmas, Holidays, Mother's Day, Dinner Parties, Birthdays and more. 5. All Deconovo aprons are made of ultra light material, making it easier to cook, BBQ, bake or for any of your cooking needs. This apron are 65% polyester and 35% recycled cotton blend. These aprons have fixed neck tie and adjustable waist straps making it easy to tie and comfortable to wear. Size: 32 Length, 26 Width, one size fits most people. The apron is so versatile, especially perfect for everyday kitchen use, BBQs and more. Package: Two pieces per package.